Alisson Ramses Becker, the Brazilian goalkeeper was born on 2nd October 1992 in Novo Hamburgo, Brazil. Standing over 6ft 3”, Becker is known for his quick adaptability and unflinching determination in front of the goal. While representing Brazil at the international level, he currently plays for the club A.S Roma in Italy’s top division league. Footballing days began early for the prodigy, when he joined the academy of the Brazilian club Internacional in 2002, which is a club in the highest tier of the Brazilian football league system. Alisson joined the youth team along with his elder brother Muriel, who currently plays for Portuguese club Belenenses. Alisson had to keep his head down and work hard for over four before breaking into the senior team. Alisson was called for the Brazil U17 team in 2009, where he made 9 appearances for the team. He was a part of the U21 side in 2013 and as well, but had to wait till 2015 before the selectors saw him a suitable fit for the senior side. 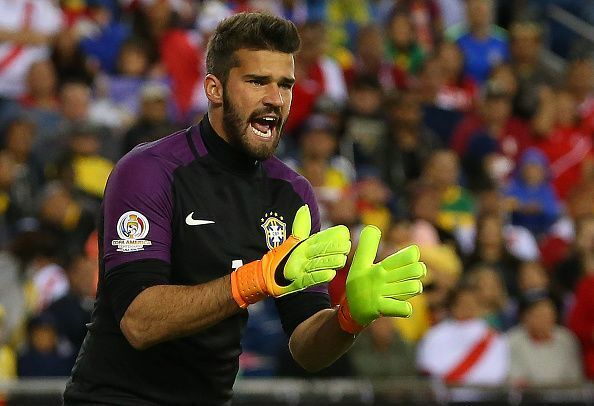 Alisson made his professional debut for Internacional in 2013, playing in the Campeonato Gaúcho Championship. His Serie A debut also came in the same year against Goiás while serving as a backup keeper to his brother. Alisson made only 6 appearances in his first season. Allison grew immensely as a keeper at Internacional. The year following his debut saw him playing only 11 games in the season as he had to compete with another Brazilian keeper Dida. However the 2016 saw him becoming the main keeper for the side and he made 57 appearances in all competitions. Carrying his team to the fourth consecutive win in Campeonato Gaúcho Championship, Alisson announced his arrival in style. This led to his transfer to one of Italy’s top clubs, AS Roma for 6 million Euros. Alisson made his debut for the team in the UEFA Champions League against FC Porto. Alisson struggled initially as he was not used to the defenders playing high up the pitch, which was different from the South American style. As a result, he only played 15 matches and that too only in the cup competitions. With the transfer of Roma’s starting keeper Wojciech Szczęsny, Alisson moved into the limelight and was soon starting games for his team. His ability to save both close range and long range shots make him one of the most exciting goalkeepers in the recent times. Who are the best goalkeepers currently in the world?